If you’ve ever been in a freshly painted space, chances are you’ll remember the distinct smell. The familiar, strong “new paint smell”, is more often than not caused by harmful VOCs in your painting products. VOCs, volatile organic compound, are carbon-based chemicals that readily evaporate from liquids to gases at room temperature. 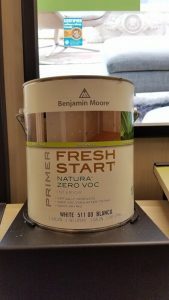 The benefits of using low or no VOC paint products are striking on both a small and large scale, providing health benefits for you and your family, as well as the planet. What are the benefits of Low or No VOC Paint? By choosing to paint with low or no VOC products, you no longer have to compromise your air quality. According to the United States EPA, the levels of several organics average from 2 to 5 times higher indoors than outdoors. This number dramatically increases during and for several hours immediately after certain activities, such as paint stripping, where levels may reach 1,000 times the outdoor level. Nonetheless, these volatile compounds can persist long after the paint has dried. ear, nose, and throat irritation, headaches, loss of coordination, nausea, damage to the kidney, liver, and central nervous system, and has been found to cause cancer in animals. The use of paint products emitting chemical gases in your home contributes to greenhouse gases and the depletion of the ozone. However, by choosing to use low or no VOC paint, you reduce your carbon footprint and make a positive impact on the environment. Who Benefits from Low or No VOC Paint? The use of low or no VOC paint products is a win-win for all. However, some people are more at-risk from the health impacts than others. Due to the short and long-term consequences of chemical gases in the environment, pregnant mothers, newborn babies, children, asthma and allergy sufferers, and the elderly will benefit most. It is important to get educated on the multitude of problems that those at-risk may suffer from if they encounter VOCs. VOCs have been known to cause leukemia in children and can also trigger asthma and allergies in a person who may not have been as susceptible before the possibility to trigger asthma. Ready to Paint the Interior of your Raleigh Home? Please contact A Touch of Color today to schedule your free and customized painting project estimate. With over 15 years of experience for each of our painters, we offer the professionalism and quality that cannot be matched! Our experts are passionate about the use of eco-friendly, zero-VOC paint products, and are on hand to help you pick and plan the best products and colors for yourRaleigh interior home painting project. We provide services to the Raleigh, Wake Forest, Cary, and Chapel Hill areas. Please view our portfolio and contact us today with questions or to receive a free estimate: 919-426-4928!